The Night King's armor and the seat of the Iron Throne are all made of crafting foam and a lot of hot glue. The base of the Thone is a wheelchair, so that it could be moved around. The back of the throne is cut from wood and painted, as are Jon Snow's and Arya's swords. This was a year in the making, and we are very proud of how it turned out. Included is one large group photo, a picture of the Night King and Jon Snow fighting for a better view of Jon's hand carved sword and the Night King's foam armor, and a photo of Daenerys and Tyrion for a better view of the Iron Throne. 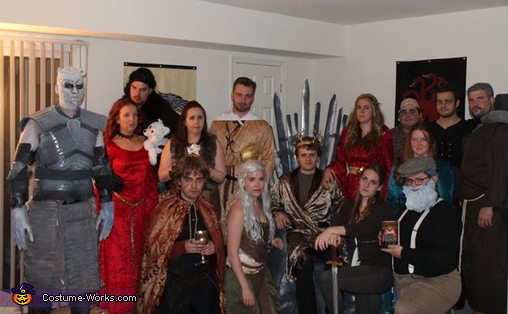 In the large group photo characters are as follows (left to right): Night King, Melisandre, Jon Snow and Ghost, Ygritte, Tyrion Lannister (bottom), Jaime Lannister, Daenerys Targaryen (bottom), Joffrey Baratheon, Cersie Lannister, Arya Stark (bottom), Varys, Sansa Stark (middle), George R.R. Martin (bottom), Robb Stark, and Hodor.